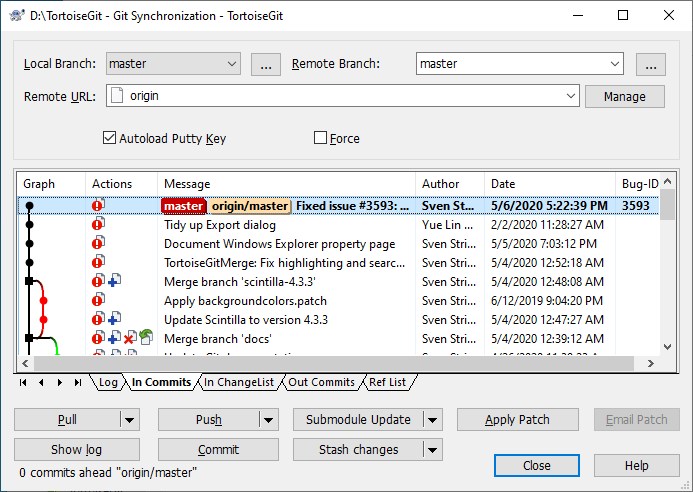 The Sync Dialog provides an interface for all operations related with remote repositories in one dialog. This includes push, pull, fetch, remote update, submodule update, send patch... However, the sync dialog provides less options as the regarding dialogs (cf. the section called “Pull and Fetch change” and the section called “Push”). The sync dialog can be opened using Sync... . The Sync Dialog will show. Local Branch: The source branch which will push/pull to/from other repository. If the current branch or the selected local branch has a remote tracked branch set, the remote branch and remote repository are automatically selected. A remote tracked branch can be set using the reference browser (cf. the section called “Browse All Refs”) or using the push dialog (cf. the section called “Push”). Remote Branch: The remote branch of a remote repository. Remote URL: Choose remote repository or input remote repository URL. Manage Add new remote name. When you press the shift-key while selecting fetch, pull, fetch, stash changes or submodule update/sync you can open the separate dialog boxen which allows you to control more parameters for the specific operations.